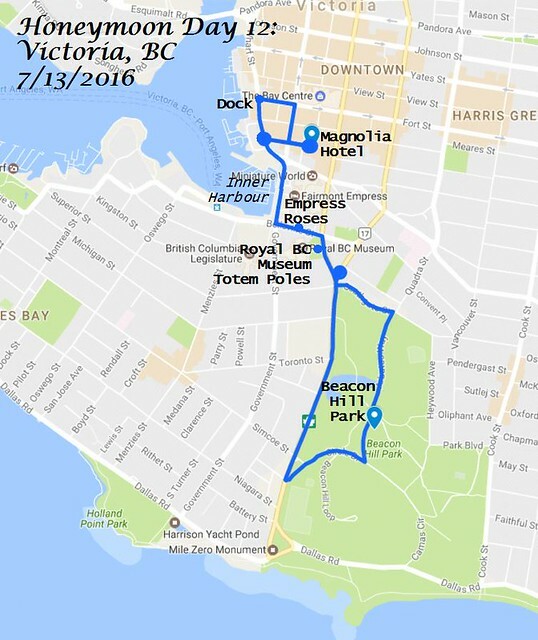 Victoria, the “Garden City”, is the capital of British Columbia and is situated on the southeastern tip of Vancouver Island, only twenty miles north of Washington State. It has a temperate, sub-Mediterranean climate with mild and rainy winters and relatively dry summers, and is one of the sunniest places in Canada. We Okies think of the Pacific Northwest as gloomy and rainy, but Victoria sits in the rain shadow of the nearby Olympic Mountains. It is the driest location on the British Columbia coast, averaging 24 inches of precipitation per year, with about 10 inches of snowfall. That contrasts with Bartlesville’s humid sub-tropical climate. We get about 40 inches of precipitation annually, including 9 inches of snowfall. More significantly for our honeymoon, Bartlesville’s average temperature in July is 93 degrees, while Victoria’s is 68 degrees. But my use of Fahrenheit reflects my American upbringing; a Canadian would say Victoria reaches about 20 degrees Celsius in July while Bartlesville shoots up to 34 degrees! Wendy and I spent four nights and three full days enjoying the mild and sunny weather in Victoria before heading back to the states. Our first day featured a walk of a couple of miles to and from Beacon Hill Park. I discovered that 200 acre park on my first visit to Victoria in 1998. One day I ventured southeast from the Inner Harbour and spent a lovely afternoon strolling through the park. I stumbled onto a fun afternoon jazz concert by Chris Millington and his band, which I would later hear again in Butchart Gardens a decade later when his group was playing dance tunes. For this visit, I knew Wendy would love to see some roses, and a small rose bed was promised in the middle of the park’s 3/4-mile long western edge. So that became our target after we enjoyed breakfast at the Magnolia Hotel’s Catalano Restaurant, paid for by the hotel credit our neighbors had arranged. 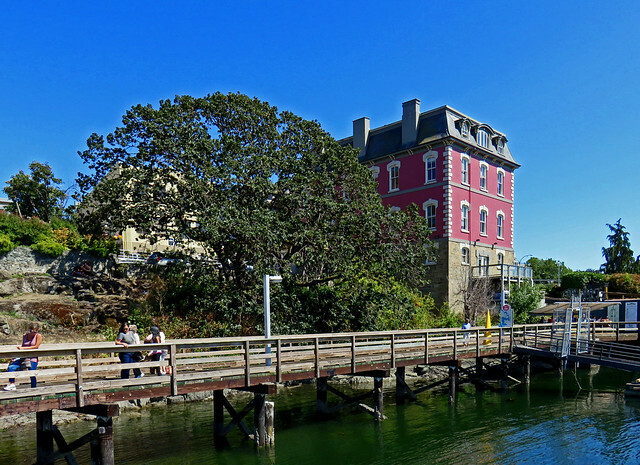 We walked a couple of blocks to the Inner Harbour Causeway just west of the Empress Hotel. A mosaic orca statue near one entrance caught our eye. The causeway always features artists and buskers, and during this trip we were entertained by Dave Lang & The Insolent Rabble. 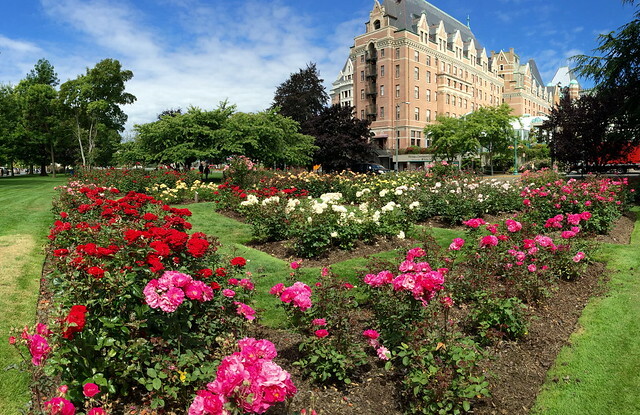 Leaving the causeway, we turned east across the hotel’s south lawn, and Wendy stopped to smell the roses. There were roses all along the south side of the hotel, including a large plot of beautiful specimens. She mentioned these in her earlier blog post about honeymoon roses. That was our favorite rose garden from the entire trip, although the famous Butchart Gardens certainly had magnificent, if crowded, rose gardens which we would tour the next day. 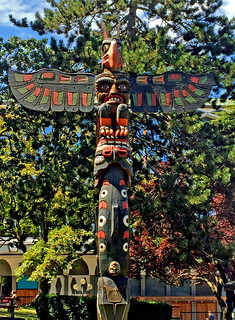 We walked south on Douglas Street past the totem poles outside the Royal British Columbia Museum. In 1941 six vacant lots were transformed into Thunderbird Park, and the museum displayed its collection of totem poles. The ones now on display are replicas of the originals, which have been moved inside to be preserved. Mungo Martin, a Kwakwaka‘wakw master carver, Henry Hunt, and Hunt’s sons Tony and Richard created most of the replicas. The chief carver is now Nuu-chah-nulth artist Tim Paul. Wendy got a kick out of the totem pole figures. 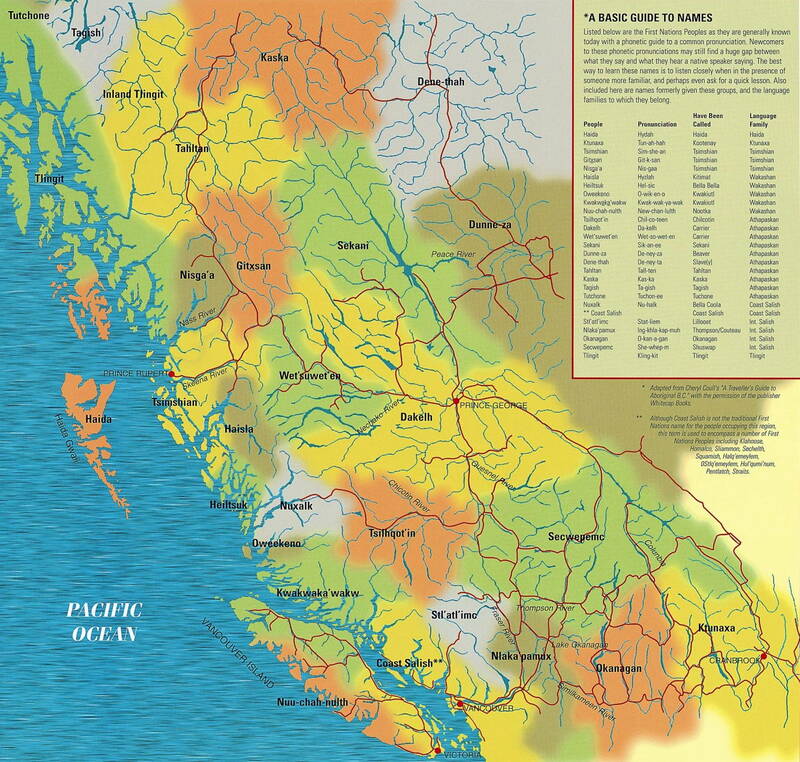 I found a map online to help me figure out where the originating First Nations were located who carved the poles. 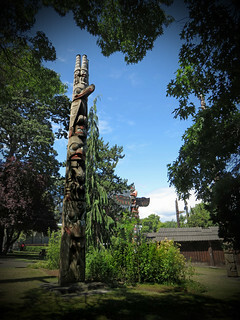 Two Haida mortuary poles are on the south end of the park. They were erected at t’anuu ‘llnagaay (eelgrass town). One was built for a high-ranking woman who was shot while traveling through the San Juan islands. Her cremated remains were placed in the cavity behind the frontal board. The other was in front of the House That Makes a Noise, a large six-beamed house owned by Gwiskunas, a member of the Qadasgo Creek lineage of the Raven clan of the Haida. 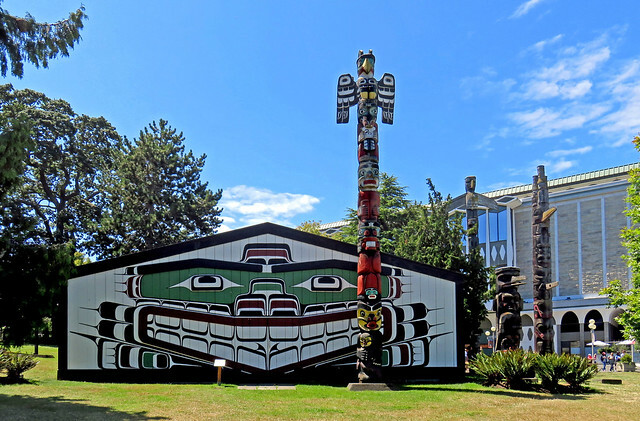 A Kwakwaka‘wakw Heraldic Honouring Pole was built to recognize the Hunt and Whonnock families of the carvers. It was carved by Sean Whonnock and Johnathan Henderson in 1999 from a log that was 553 years old. Nearby is a Gitxsan Pole, raised by chiefs Tu’pesu and Wawralaw in the second half of the nineteenth century at Gitsegukla (Skeena Crossing). Its name translates to Great Protruding (Being) from the Lake and includes a section of figures representing a legend of a woman crossing the lake who saw the faces of children in the water, leading to a song about that vision becoming a crest for her family. Another Gitxsan Pole named Skim-sim and Will-a-daugh belonged to Chief Wiha (Wee-kha, Ernest Smith) of the Wolf (Gilt-Winth) clan. Topped by a giant woodpecker, it has a prominent beak of the mountain eagle Skim-sim, who kidnapped and mated with a young woman and devoured their offspring. At the base is Will-a-daugh, a chief’s niece at Ke-an (Prince Rupert), who carries with her a child she conceived from a wood grub. Seems like a rather gruesome pole from my perspective, but we’re just getting started. The Wawadit’la House was built by Mungo Martin as an authentic Kwakiutl house with the hereditary crests of his family on the house-posts. 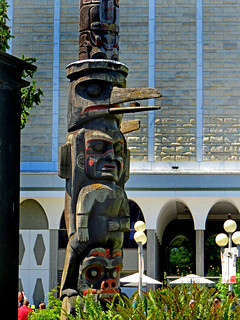 The Kwakwaka‘wakw Heraldic Pole out front features crests from the various nations of the tribe. At the base is Dzunukwa, the Wild Woman of the Woods. The story goes that a man chased her for stealing dried fish and eventually married her, and her half-human son became the founder of the Namgis family at ‘Yalis (Alert Bay). Wendy particularly liked the Huxwhikw, or Cannibal Bird, that graced the top of a Kwakwaka‘wakw House Post. The story is that this servant of Baxwbakwalanuksiwé, the Cannibal-at-the-North-end-of-the-World, uses its long snapping beak to crack open the skulls of men to eat their brains or pluck out their eyeballs. Ewww! I’m glad that the bird now has a disc in its beak to change the reference to the Raven stealing the sun, a story of how the Raven was once a snow-white bird who fell in love with the daughter of Gray Eagle, the guardian of the sun, moon and stars, and fresh water. Gray Eagle hated people and kept these treasures hidden. Raven stole the sun, moon and stars, and water hanging on the side of Gray Eagle’s lodge, along with a brand of fire. Raven flew with them up through the lodge’s smoke hole. He then hung the sun up in the sky along with the moon and stars, and dropped the water on the land. The fire brand’s smoke turned the Raven black and eventually burned his bill, so he dropped it into rocks, which is why if you strike two stones together sparks of fire fly out. I’m not sure of the physics in that tale, but I sure like it better than skull-cracking cannibal birds! We eventually reached the tiny plot of roses at Beacon Hill Park. 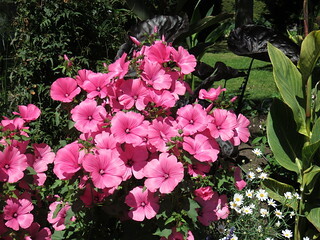 They paled in comparison to the roses at the Empress, but the park did feature many beautiful plants, including Tibouchinas, pink stunners, and a fascinating Red Tiger flowering maple. It isn’t actually a maple, but this Abutilon’s leaves resemble that of a maple. 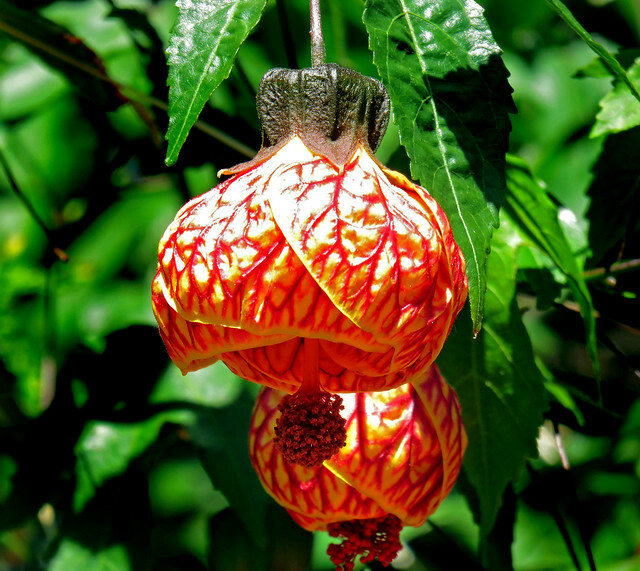 It has yellow flowers with deep red veining that remind me of Chinese lanterns, complete with pull cord. Walking back towards our hotel, we passed through the park’s open grassy hilltop, lovely ponds, and majestic trees. It is truly a wonderful urban park. We were hungry by the time we returned to the hotel area, so we had a tasty lunch at The Old Spaghetti Factory. As we passed the Inner Harbour Causeway on our way back to the hotel, we could see the Coho ferry we would be riding back to Washington in a few days. I got a shot of boats with the British Columbia Parliament Buildings in the background. Each night from our hotel room we could see them outlined in lights. We had started our walk with a mosaic orca, and ended with a horicultural one: the Surfacing orca made of plants at one street corner. Later that afternoon, Wendy relaxed at the hotel while I walked over to the Old Victoria Custom House. This striking three-story building was completed in 1875. I like its bright red brick walls with stone corner quoins. One of the houses on our cul-de-sac acquired some weird fake stone corner quoins a few years back, and let’s just say that the Custom House pulls off the look much better. I didn’t just walk over there to see the Custom House, however. I walked out on a nearby float to view the seaplanes, boats, and kayakers. 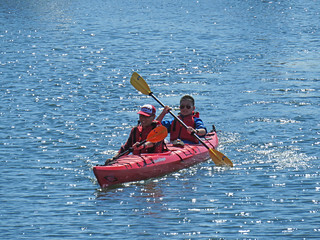 I watched with some amusement as tourists made their way across the harbour, some struggling to dock their kayak at a rental shop. 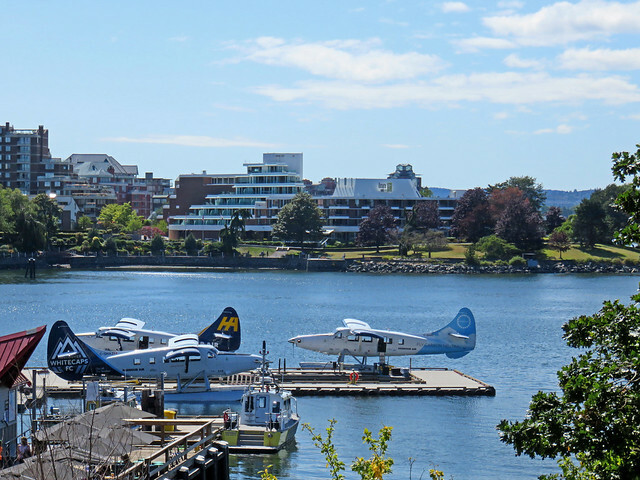 Back in July 1998 my friend Wendy Robinson, who at that time taught science at Bartlesville High and was known as Miss R., treated me to a birthday ride on an old de Havilland seaplane out of Victoria’s Inner Harbour. It was great fun to take off and land on the water. I’d always wanted to fly in a seaplane since reading The Viking Symbol Mystery as a young boy. In that tale the Hardy Boys visited the Canadian Northwest Territories and learned to fly a seaplane. I’m not sure if it was a DHC-2 Beaver or a DHC-3 Otter that Miss R. and I rode in, but I do know one thing: it sure was noisy! I don’t plan to ever fly in one again, but it was a worthwhile experience. My bride and I had a fun first day in Victoria, to be followed the next day with a trip to the Victoria Art Gallery and Butchart Gardens. This entry was posted in art, photos, roses, travel, video. Bookmark the permalink.